David Quinn has reiterated all season that his team has a “that was then, this is now” mentality. Leave the past in the past. It might be tough for the third-year head coach of the No. 10 Boston University men’s hockey team might to admit it, but just from the look of it, this one felt a lot like one from last year. With BU (6-3-2, 3-2-2 Hockey East) down two goals after two periods, the Terriers came storming back with three goals in the third period to steal a win from No. 12 University of Michigan, 3-2. The Terriers have now earned a point in six consecutive games. Junior defenseman Doyle Somerby capped off the rally with his second goal of the year with 2:54 left in the game. For large chunks of the game, though, BU looked sloppy and played inconsistent hockey, so we’ll take a look at what went right and wrong in this Pluses and Minuses. These two teams were locked in a tight game when they met last October, a game in which BU prevailed with two third-period goals. Although BU was down two goals after the first 40 minutes this time, the third period felt eerily similar to how last year’s played out. Senior assistant captain Danny O’Regan and junior forward Robbie Baillargeon scored in 12-second span about halfway through the period, and Somerby scored the winner at 17:06. These come-from-behind third periods have been a trend over the last two weekends, as BU has totaled seven goals in its last three third periods. Judy has you covered in her sidebar about BU’s success late in the game. Sophomore netminder Connor LaCouvee had a relatively quiet third period, making just four saves. But one stop could not have been more timely for the Terriers. Moments after BU had tied the score, Michigan forward Tyler Motte broke loose from center ice on a breakaway. Somerby came from behind him and prevented a pure 1-on-1 chance with LaCouvee. But in the process, the referees determined that Somerby had slashed Motte’s stick as he went in on goal, and Motte was awarded a penalty shot. LaCouvee, anchored in the crease, held his position throughout the chance, and was in great position to stop Motte’s penalty shot, which went low blocker side. A save and a pump of the fist later, and the score stayed tied. Quinn said he didn’t see LaCouvee’s celebration after the save, but said that his goalie’s mentality has been important in this recent stretch. What they’ve also received is consistent play in net, which appeared to be a question mark early in the season. But LaCouvee has allowed three or fewer goals in his last four starts, and now owns a .920 save percentage for the season. 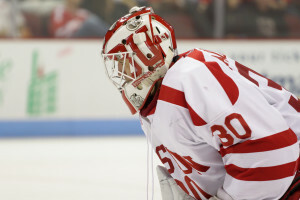 For most of the game, like every other unit, BU’s third line was shut down by the Michigan defense and goaltender Steve Racine. The line composed of sophomore winger A.J. Greer, Baillargeon and freshman forward Bobo Carpenter had chances, especially near the doorstep from Greer, early on but could not find the back of the net. Just a tick before the 11-minute mark in the third period, they finally were rewarded. Baillargeon took a pass from Carpenter behind the net and then curled the puck on a wraparound past Racine for the tying goal. All three skaters earned a point on this tally. ESPN personality, and avid lover of college hockey, John Buccigross was in attendance for Friday night’s game. For those who don’t know, the last three BU games — and two this season — that Buccigross has either announced or attended has ended in a Terrier loss. That changed against Michigan, and the so called “Buccigross Curse” has been lifted, if there ever really was a curse to lift. 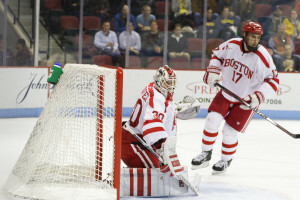 BU prided itself on playing a strong end-to-end game against No. 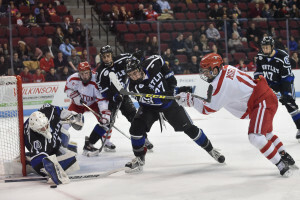 1 Providence College last weekend, but that was far from the case Friday. The Wolverines displayed a quick forecheck and won just about every puck battle in the first two periods. BU had trouble matching the pace and quickly fell behind on the scoreboard and in shot attempts. Michigan also had net-front presence and clogged the middle on the defensive side to prevent prime opportunities. Through two periods, Michigan had out-attempted BU 52-35, which was pretty indicative of how the Wolverines controlled the game. For the second week in a row, moments after the Terriers took a late lead, a penalty followed. Last week, senior assistant captain Matt Lane’s slashing minor led to the tying goal. This week, Greer took a hitting from behind penalty with 2:28 remaining on the clock, setting up a frantic rush by the Wolverines. A few deflections and shots that went inches wide could have ended up tying the game if they had gone the other way. As strong as LaCouvee was in the series opener, this area of the net seemed to give him some fits. Michigan’s first goal from forward Alex Kile was an odd-angle shot that snuck between LaCouvee’s pad and the post. A similar play happened in the second period on the other side of the ice, and LaCouvee looked bewildered on where the puck was. Fortunately for him, it was stuck between his pad on the post and not over the goal line. It was a weird group of plays, but it’ll be interesting to see if Michigan looks to attempt more on the nearside of the net Saturday afternoon if LaCouvee gets the starting nod. For the second straight game, the No. 11 Boston Univeristy men’s hockey team eked out a 5-4 victory — though this week, it didn’t need overtime. The matchup against Northeastern University was highlighted by some big goals and some stressful back-and-forth action — and an even more stressful final few minutes. But in a game with that much action, it gives us a lot to talk about in this edition of Pluses and Minuses. Forgive that terrible attempt at a joke. But man, was sophomore goaltender Connor LaCouvee huge in that third period. He calmly turned away 19 shots from Northeastern in the frame, preserving BU’s 5-4 lead and holding off a 6-on-4 attempt from Northeastern for the final minute-and-a-half of the game. He ended the game with a career-best 36 saves. Despite some shakiness in the middle period — LaCouvee admits to perhaps losing some focus in the second — he was able to turn in a staunch performance in his second straight start. In a year with some uncertainty as to who the starting goaltender will be, BU head coach David Quinn has mentioned time and time again that he doesn’t think his goaltenders’ stats this year are indicative of the performances they’ve had. LaCouvee, too, said that as he’s grown as a goaltender, he’s become less focused on individual stats and more keeping his team in the game. We’ve praised junior defenseman Doyle Somerby for much of this season for his increased speed and poise on the offensive end. But in Friday’s game against Northeastern, Somerby went back to his old, aggressive ways, with one of the — forgive the clichéd word — grittiest plays of the game. In the second period, with BU attempting to limit the Huskies’ scoring attempts, Somerby blocked a shot off his leg, then collapsed to the ice in pain. He attempted to get back up probably about three or four times, falling back to the ice each time. Then he managed to stand mostly upright, and block ANOTHER shot, though it’s sort of unclear whether that he actually meant to do that — “I’m not sure if that was intentional or if he was just kind of in the way,” LaCouvee later said about the play. Regardless, it was a “huge” play, according to Quinn. “He was immense tonight, he was physical, he did a great job on the penalty kill [and] blocking shots,” Quinn said. Quinn is pretty modest about the offensive ability of his team’s defensemen. Nonetheless, defensemen accounted for three of BU’s five goals on Friday, and they’ve accounted for a significant chunk of their offense this season – 10 of the Terriers’ 26 goals have come from defensemen, to be exact. Sophomore defenseman Brandon Hickey is tied with freshman forward Ryan Cloonan for the team lead in goals, as Hickey had a third-period, game-tying tally to bring his season total to four goals. With his third goal this season, tripling his goal total from last year, sophomore Brandon Fortunato ranks second among all Hockey East defensemen in scoring with seven total points. On that same note of defensemen getting on the board, senior captain Matt Grzelcyk had a goal and an assist in his first game back after recovering from offseason surgery. Andrew has more on Grzelcyk’s triumphant return to the ice in his sidebar. In his postgame comments, Quinn kept bringing the topic back to the number of penalties the team committed in the game. BU had nine penalties in the game — one matching — thus giving Northeastern 16 power-play minutes. The Huskies were able to capitalize, recording 12 shots and earning one goal from their power-play unit. It’s hard to ignore the glaring fact that BU did allow four goals in the second period. As we stated earlier, LaCouvee admitted to his lack of focus, and Quinn noticed a similar theme, which caused him to call a time out after Northeastern’s fourth goal. “I thought we lost focus … people just not paying attention and taking on their responsibilities,” he added. 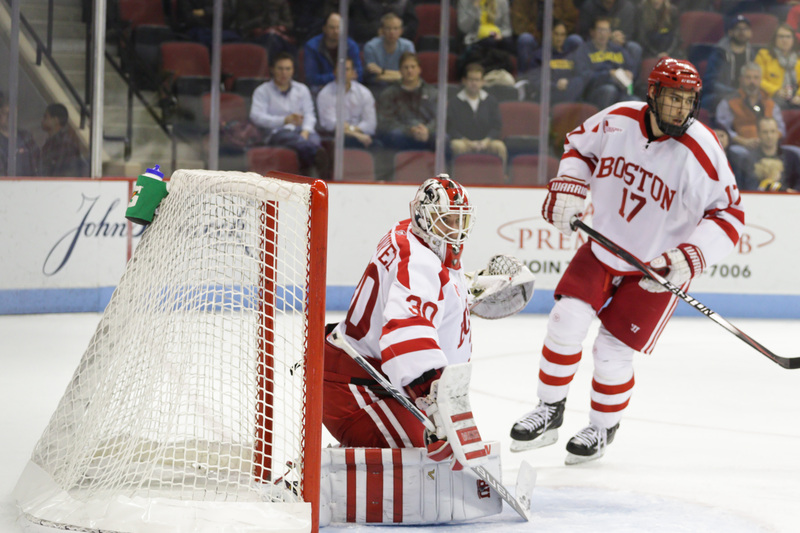 The Boston University men’s hockey team faced a situation it had not been in all year — a deficit. 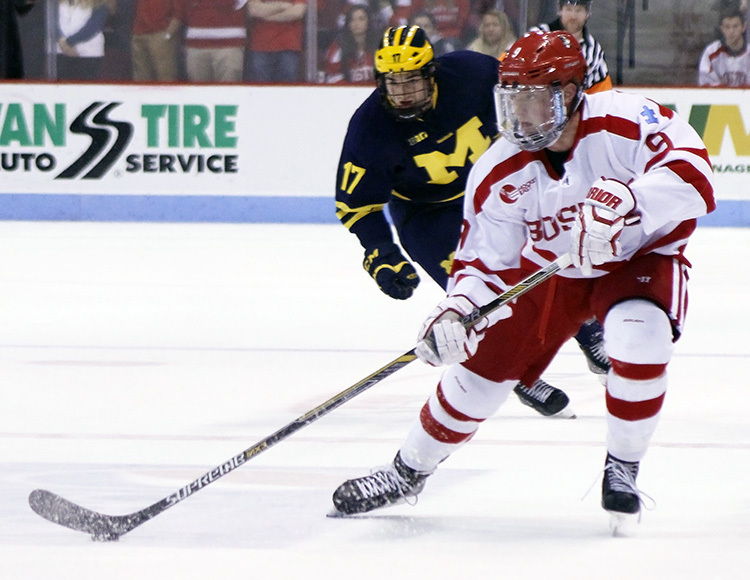 Freshman forward Jack Eichel scored the game-tying goal in the third period of BU’s win over Michigan. Worst of all for the Terriers (3-0, 1-0 Hockey East), they trailed going into the final period against the University of Michigan. With some determination up front and the help of video reviews, BU won 3-2 after a back-and-forth third period. The last time the Boston University men’s hockey team won a game in which it trailed heading into a third period, Jack Parker was still coaching. To be exact, the Terriers had not completed the feat since Jan. 4, 2013 in an overtime victory against Rensselaer Polytechnic Institute. For a team that went winless all last year during those situations, this win felt even more special. Freshman forward Jack Eichel turned a 2-1 deficit into a tie game on a deflection just under three minutes into the frame. Junior center Matt Lane finished off the win on a tip-in of his own at the 16:50 mark. BU coach David Quinn said having quality play from all four lines has made for improved third periods this season. “I think our depth up front allows us to kind of keep guys fresh,” Quinn said. “When you kill five penalties and get two power plays that kind of throws things out whack a little bit. BU’s special teams unit allowed two goals on three chances through the first two periods of Friday’s contest. When Michigan went to the power play again with four seconds remaining in the middle frame, an already shaky PK would have to work hard to keep the game within reach. After the Wolverines rattled off shots toward junior goaltender Matt O’Connor, the defensive corps warded off the infraction. It was not pretty, but according to junior captain Matt Grzelcyk, it set the tone for the rest of the game. Not long after the penalty was over, Eichel potted the game-tying goal, putting BU in prime position to earn at least one point. As much as the penalty kill had its problems, this one attempt changed the complexion of the game. 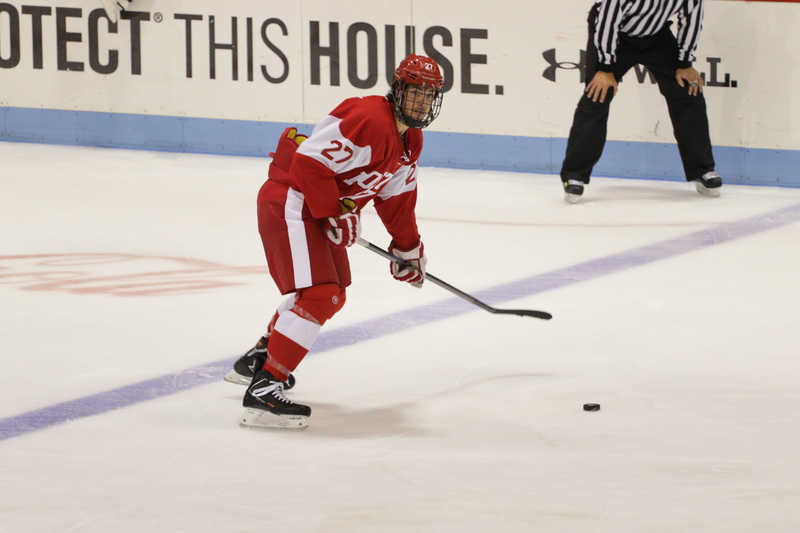 Before Saturday night’s game, freshman defenseman John MacLeod was ruled out with an injury. Somerby, the sophomore New York Islanders draft pick, shined in his absence. This play more than juxtaposes his freshman campaign where he led the team in penalty minutes. Despite being listed on BU’s third pairing, Somerby played significant time with Grzelcyk on the top unit. The sophomore worked hard along the boards, used his body to knock pucks loose and made key clearances out of BU’s defensive zone. On top of all of that, he recorded the primary assist on the tying goal after his shot from the right point was redirected. The Terrier defensive unit combined to kill six Michigan State University penalties on Friday night. The story was not the same for the penalty kill unit against the Wolverines. Both of Michigan’s goals came via extra-man chances. Whether it was failed clearance opportunities or leaving snipers wide open, the Wolverines took advantage of BU’s mistakes. One area the Terriers have struggled in through three regular season games is their effort on the draw. In BU’s first game of the weekend, it won just 37 percent of its chances on the draw. Saturday night’s effort did not improve, as the Terriers won 39 of 62 efforts in the dot. Eichel especially had problems corralling faceoffs, losing more than he won in both games. For the Terriers to maintain more possession, draw control success is essential. Junior forward Ahti Oksanen’s goal 34 seconds into the second frame looked to give the Terriers the jolt they needed. After an initial offensive rush, though, Michigan controlled the flow of the stanza and took 12 shots on goal to BU’s nine. The Wolverines attacked in the offensive zone and the young crop of Terriers had trouble regaining momentum. What started as a good period nearly ended in disaster.